Neale Davidson, the maker of this site, the fonts, and all of the artwork herein has passed away. After a lot of soul searching and a little bit of legal advice, I have decided to keep the site up and the fonts for sale, and wanted to post a public update on the status of the site, and especially of the fonts and the commercial licensing. As his widow, I have inherited the site and copyrights, and have access to the records of previous purchases for bookkeeping purposes. All previous commercial licenses will, of course, remain valid. Anyone who has licensed a font will retain the rights as described in the EULA without any changes. As I get the chance, I will start updating the EULA and copyright notices here and in the font packages with my name, but I wanted to publish a public notice of the change in copyright for everyone involved. My apologies, but I don’t have any plans to create any additional fonts, nor do I have the expertise to update the fonts my husband created. However, I will support the existing fonts’ usage to the best of my ability and knowledge. If you have any questions or concerns, I am available at the same contact email: jaynz@pixelsagas.com. Thanks for your understanding. This entry was posted in Uncategorized on January 12, 2017 by Jaynz. Fontana is based on the Pocket Books titling for their Star Trek novels through the 1970s and most of the 1980s. Includes accent characters, extended punctuation, and Euro. Includes bold and italic versions. 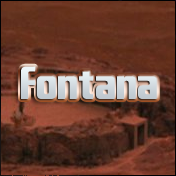 “Fontana” is named after DC Fontana, one of Star Trek’s most prolific authors. This entry was posted in Uncategorized on June 2, 2016 by Jaynz. 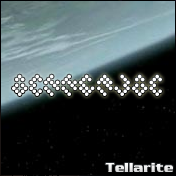 Tellarite is an unusual dot-based (quasi-braille looking) face based on the Tellarite language glyphs found in the Star Trek: Enterprise television series from Paramount/CBS Pictures. Includes all canon characters mapped to their appropriate English equivalents. * Mild cleanup and re-release. 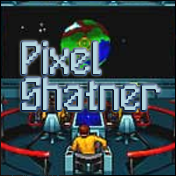 Pixel Shatner is a pixel-based font based somewhat on the title lettering from the Star Trek franchise as it appeared in several early games from Interplay in the 1990s. Includes full alpha-numerics, extended punctuation, and Euro. This entry was posted in Uncategorized on May 31, 2016 by Jaynz. 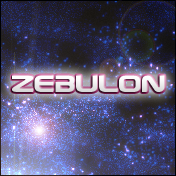 Zebulon is a science-fiction themed face based on the title logo of TSR’s classic Star Frontiers game series. Includes full alphabet, extended characters, Euro. Includes condensed, bold, italic, bold-italic, hollow versions. This entry was posted in Uncategorized on April 26, 2016 by Jaynz. 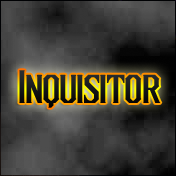 Insipired by the Dark Heresy sub-titles from Fantasy Flight Games, Inquisitor is a tall, thin typeface with a basic gothic look and feel. Includes full alphabet and numerics, extended punctuation, and euro. Available in regular, bold, italic, and bold-italic weights. This entry was posted in Uncategorized on March 1, 2016 by Jaynz. Plavsky is an LCD-style typeface based on the computer and television lettering found in Bandai/Sunrise’s “Gundam: Build Fighters” series. Includes full alphabet, extended punctuation, Euro. Includes Bold, Italic, and Condensed versions. This entry was posted in Uncategorized on February 23, 2016 by Jaynz. Volkoff is a stylized military-stencil typeface given upper-caps and a minor ‘Soviet-Era’ Russian flare with some glyphs (such as the backwards ‘R’.) Includes full alphanumerics, extended punctuation, Euro. Includes regular and italic weights. * Added OE, oe, and per-mille characters. This entry was posted in Uncategorized on February 11, 2016 by Jaynz. Comic Book is one of my first ‘scan and build’ fonts but I unfortunately don’t remember which comic book page I used to start work on it. It is designed to resemble the lettering of a typical comic classic book. Includes full alphabet, extended punctuation, Euro. Includes bold, italic and bold-italic versions. This entry was posted in Uncategorized on February 4, 2016 by Jaynz. Named after the “last good year” of the classic pulp period, Thirty-Seven is a strong, bold art-deco font with a thick vertical stroke and thinner secondary strokes. Capital letters have a minor decorative ‘cut’ in the bold stroke as well, giving it more of the marquee look. Includes full alphabet, numerals, extended punctuation, and Euro. Available in regular and italic styles. This entry was posted in Uncategorized on January 14, 2016 by Jaynz.